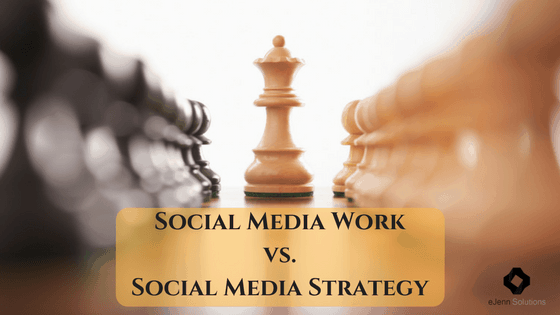 Before posting anything on social media, it’s important to understand the difference between working on social media posts and having a social media strategy. Although on the surface they may seem the same, there are big difference both in costs and results. Essentially, social media work involves creating and publishing posts. You may have a schedule you use, or not. The posts may involve a broader theme or be more on a whim (even if you schedule them in advance.) At first, this may seem like a good idea. You’re posting more which is getting your name out there more and it’s fairly inexpensive – especially if you do it yourself. There are a few problems with this, however. First, although your brand is more active on social media, the posts likely lack cohesion. They may not clearly and correctly promote your brand and your purpose. In addition, posts without a strategy behind them are likely to be shorter lived and give you less mileage. Thus, in the end, it’s costing you time and money rather than enhancing your brand and helping you develop leads. Social media strategy, on the other hand, provides the same name recognition benefits as social media work, but also adds a lot more value. While posts created without a strategy may fail to accurately portray your brand and your purpose, posts created with a strategy take branding into account each and every time. This includes adding your website and/or logo to posts you create as well as any graphics and written content. In addition, posts shared from a third party source fall within your social media strategy. For example, third party shares may be from businesses you partner with or companies you want to notice you. On the surface, social media strategy costs more, however, when you factor in the ROI of educating people about your brand and mission along with the brand recognition and leads that generates, it’s a better value for your marketing dollars. In addition, your social media strategy will drive any social advertising campaigns you create. Whether boosted posts or sponsored ads, each of these will have a direct link back to your strategy and thus provide the best results for your marketing dollars. When you consider the true value of your marketing dollars, it makes sense to spend the time creating and consistently re-evaluating your social media strategy. At eJenn Solutions, we know each person is at different levels in their business – so we’ve developed different packages. We have 3 packages that are designed with your budget and need in mind. Package one is our social media work package – as described above – this is a low-cost way to keep your social sites active and fresh. we always encourage our clients to add in their own content and photos when they are able. The time-consuming part of finding content and posting on all sites (Facebook, Twitter, Google and LinkedIn) is how we help. We also handcraft each post to the format and culture of each site. Take a look at our EZ social media package to see if that fits your needs. We have a mid-sized package with provides you with options for your needs. 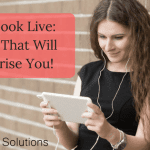 While this package does not carry a social media strategy, it does add in some additional options like finding Twitter followers perfect for your company or help with boosting Facebook Post / creating “like” campaigns, or the option of adding in Instagram. You can learn more about this package here! Lastly, our last package incorporates everything and can be customized. These packages can include Facebook ads, Blogger Outreach, Newsletters, blog post creations, Instagram branded graphics and yes … a social media strategy for your company. To learn more about this type of work with eJenn solutions – please contact us directly here! We look forward to helping you and your business!